← Should Seville’s barefoot nuns have faith in my cake-baking skills? The Eagle Aqueduct (El Puente del Águila) was built in the 19th century as a means of supplying water to the San Joaquín sugar factory on the outskirts of the town of Nerja. Damaged during the Spanish Civil War, but recently restored, the Eagle Aqueduct comprises four storeys of superimposed brick arcades with 37 arches. Soaring high above the spire at the central point of the structure is a weather vane in the shape of a double-headed eagle, from which the aqueduct takes its name. The structure is 40 metres tall and 90 metres wide, with it’s design being typical of the period of construction, when the Mudéjar-style was very popular. Situated on the Barranco de la Coladilla and spanning a ravine close to the Nerja Caves and the village of Maro, the aqueduct is visible from the old N340 coast road linking Nerja with Maro. With a backdrop of the Sierra Almijara, it´s easy to see why this is one of the most photographed images of the local area. There is a lay-by at the side of the road where you can leave the car to get a good view or to take photographs of the monument. The area surrounding the aqueduct is public land and free to visit. Strangely, the facade visible from the viewpoint is the rear of the construction, as the aqueduct faces north. The Eagle Aqueduct was NOT built by the Romans, as many believe, though the remains of a Roman bridge and the old Roman road to Malaca (Málaga), were unearthed nearby. Despite the closure of the San Joaquín sugar mill many years ago, the aqueduct continues to be used for the irrigation of local farmland. This entry was tagged Andalucía, architecture, East of Malaga, Europe, history, Malaga, Maro, Nerja, Spain, travel, Travel theme. Bookmark the permalink. Oops I’m one of the people who thought it was Roman, have pointed it out to visitors as such… Really interesting piece and fab shot! What an amazing structure, Marianne. Just imagine building it. It’s very different in design from others I’ve seen. Of course, the Spanish San Joaquin is Saint Joaquin in English – so I guess the name must be used in many Spanish speaking countries, or at least with some previous connection to Spain. Wow, this must be one of the most beautiful aquaducts ever! Great photo! There’s a fantastic aqueduct in Segovia, Spain that I’m hoping to have a look at next Spring. I think it’s a bit older (and bigger) than this one, but I’ll keep you posted! 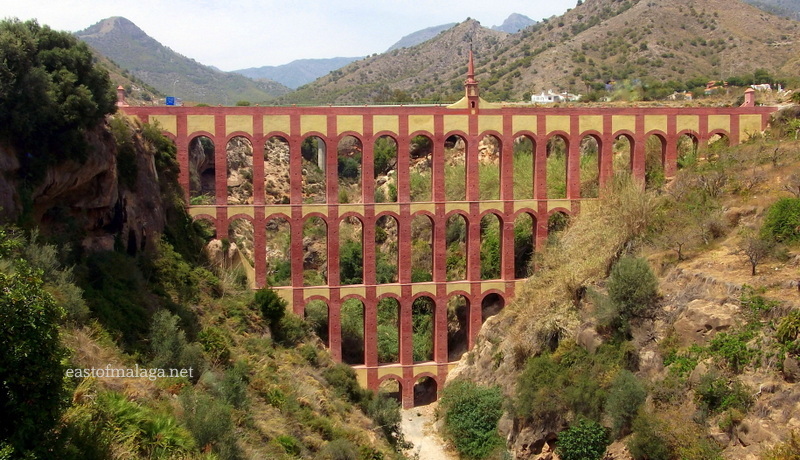 I’ve seen this aqueduct before too when I was studying abroad in Malaga. Some fellow American students and I took the bus to Nerja to go to the beach and decided to visit the caves. We (unwisely) decided to walk from Nerja to the caves (it was a lot further than we realized!) and we got a view of the aqueduct from the road we were on. It was not painted red and gold at the time so it hadn’t yet been restored. It was covered in scaffolding and restored between 2009 and 2011. To be honest, I never saw the aqueduct before it was restored, but I have seen old photos. I am sorry I missed this lovely piece of architecture when I was in Nerja many years ago. I love the little ‘steeple’ on the top. Yes one day… I hope to get back! This is just amazing to me ! They seem such an incredibly complex way of diverting water, though – don’t you think? Amazing photo of interesting engineering! Very kind of you to say so – thanks. What an unusual and impressive structure! Glad you like it, Gilly. I always find aqueducts so huge and amazing as a means of carrying water! It’s on the far side of Nerja, Suzanne, on the old N340 coast road as you head out towards Maro and Almuñecar. Very interesting. Looks rather beautiful. Wow, I didn’t even know that was there. Must visit when I go to Málaga again this month. Let me know when you do, and I’ll take you to that tapas bar I promised! Pingback: Sweet memories: San Joaquín sugar mill | East of Málaga .... and more!